In a highly commendable gesture of altruism, Joseph Sammut yesterday donated a collection of about 300 Punic and Phoenician artefacts to Heritage Malta. The items had belonged to Chev. Sammut's uncle Ganni. Photo: Matthew Mirabelli. About 300 Punic and Phoenician artefacts collected by a Qormi blacksmith in the early 20th century were yesterday donated to Heritage Malta. The collection - dating back to pre-Christian times - was donated by Joseph Sammut, nephew of Ganni Sammut who until his death in 1958 collected objects unearthed by building contractors with whom he had business deals. Ganni Sammut also bought a number of artefacts from auctions and sometimes purchased items to prevent foreigners from acquiring them so that the artefacts would remain here. There's a photo of a few of the artifacts, which seem mostly to have been plundered from tombs. There's no mention of written materials. BOOK REVIEW: Diarmaid MacCulloch reviews Martin Goodman's latest on ancient Jews and Romans for the Guardian. MacCulloch opens with a bit of alternate history and maybe belabors the modern applications a bit. But the book sounds interesting. History which never happened both comforts and tantalises by hinting how we might have avoided present miseries. What if Rome had never grown to be more than a small, undistinguished Italian city-state? It is unlikely that any other Mediterranean empire would have obliterated the Temple of Jerusalem, as did the Roman emperor's son Titus in 70CE - at least, it is very unlikely that the temple would not have been rebuilt or redeployed for a new sort of faith. Total destruction was not the way in the ancient Near East: witness the seventh-century struggle over the ancient holy place of Mecca, which Muhammad transformed into the focus of a newly conceived religion. Without the Romans, temple worship would have continued in Jerusalem, with thousands on thousands converging on it yearly, ecstatic to end their pilgrimage in a centuries-old sacred city, as still happens on the hajj to Mecca. Martin Goodman's massive new treatment of two crucial centuries of Jewish history should be read by anyone seeking seriously to understand modern Middle Eastern tangles. His subtitle might suggest that he is a believer in Samuel P Huntington's theory of an inevitable "clash of civilisations", that malign banality underlying American neo-conservative meddling in Middle Eastern affairs. In fact, the message of the book is entirely the reverse: the ghastly sequence of events after 66CE was in no way inevitable. The previous century had been one of the most glorious and happy in the holy city's history: the temple, magnificently rebuilt by the somewhat unconvincingly Jewish king, Herod the Great, attracted more pilgrims than ever before. Jewish client kings might be cosmopolitan figures closely linked to powerful Romans: one of them, the ebulliently bisexual Agrippa II, was first a dissolute intimate friend of the Emperor Caligula, and afterwards the man most responsible for frogmarching Caligula's uncle Claudius to the imperial throne. A mark of how little the Romans expected real trouble from the Jews before 66 was the low calibre of the governors sent to this politically insignificant area, and the small numbers of troops thought necessary to govern it. ARE CENTURIES OF ANTI- Semitism really just based on ancient political spin? According to Martin Goodman's provocative and closely argued thesis, the answer is yes. If you want to trace the roots of the Holocaust, he argues, you have to dig deep in Roman domestic politics. And while you're digging, you'll find something perhaps just as shocking: that Christians promoted Jew-hating almost from the earliest days of the religion. Goodman, a professor of Jewish Studies at Oxford and a distinguished historian of Rome, has written a magnificent, luxuriantly detailed book of revelations and connections, the implications of which will take time to absorb. Much of what it says about the origins of the Jewish diaspora has a bearing on the modern Middle East, where ancient events remain fresh in the mind. His book's facility of narrative, wry appreciation of human nature and its clarity and authority in arbitrating on widespread mutual resentments, make it an important addition to studies of the roots of anti-Semitism. Goodman wears his intimate knowledge of the first few centuries of the Christian era lightly, even jauntily. His confidence comes from the historian's understanding that the politics of the Roman Empire are the politics of all empires, formal and informal. It's a matter of seeing the patterns, and knowing how the tribes related and interacted, philosophically and politically. “Maimonides,” by Sherwin B. Nuland, a professor of surgery at Yale, studies Maimonides from this medical perspective. As a 12th-century Jew living in a Muslim world, Maimonides read the ancient texts in Arabic, which provided a bridge between the Hellenistic era and that of the Renaissance and then the Enlightenment. Maimonides was among the early vanguard seeking to remove the veils of superstition of the Dark Ages that cast shadows over all learning, including medicine. He and other Jewish physicians were sought after by royal courts throughout the Muslim world and Christian Europe. NO SNAKES ON A WALL AFTER ALL? On the Agade list, Jack Sasson points to a post by Egyptologist Thomas Schneider on what appears to be an Egyptology discussion list. (I'm not familiar with it.) He is skeptical of Steiner's proto-Northwest Semitic interpretation. PETER SCHÄFER has published a book on Jesus in the Talmud. COPTIC TEXTS: A Boharic New Testament is now available online. And the same site already had a Sahidic New Testament. THERE'S A NEW SLAVONIC PSEUDEPIGRAPHA PROJECT, run by Andrei Orlov at Marquette University. Apparently he sent out an e-mail circular about it which Stephen Carlson, Tyler Williams, and others received, but I didn't. That makes me worry that my junk mail filter has started eating good messages again. JERUSALEM -- A boat that plied the coast of the Holy Land 1,300 years ago carrying fish, carobs and olives is helping researchers better understand a little-known period in the region's history. TARZANA - Their alphabet, once carved in stone or found on ancient parchment, comes alive in red and blue marker on a white board in a San Fernando Valley classroom. They might not know it yet, but the dozen or so teens who write out the letters are making history by learning their history. It's the only way their culture will survive. "It's really nice to teach them, though it's challenging," said a patient Amir Dinkha, a teacher at the Assyrian American Christian school, the first and only private campus of its kind in the United States. On the other side of the world, news reports have detailed increased violence against the Assyrians and other Christian minorities who have called the Ninevah plains of northern Iraq their home since ancient times. "It's a miracle we're even alive actually, considering all the persecution that we've gone through," Bet-Rasho said. On a recent weekday, the students in teacher Dinkha's class read aloud the Aramaic version of a Bible story. There are good-natured giggles along the way as their American-trained tongues try to grasp words similar to those spoken by Jesus Christ. While the lessons can be tough, some students say they feel as if the school is their home. It is among each other where they have found their identity. "It used to make me feel kind of down because I would tell people at school I was Assyrian, and they would say, `What's that? Syrian?"' said Justin Atneyel, 14. "I used to bring a book with me to school to show them." By the end of the school year, the students might be ready to write to those who remain in their ancestral lands, Bet-Rasho said. He does not want the Assyrian American youth to forget where they came from. "This school is dedicated to every hero who died of persecution in the homeland," Bet-Rasho said. "They died for their name, their language and their faith." The story from last March about the smaller road is here. THE EARLIEST SURVIVING NORTHWEST SEMITIC TEXT? The earliest continuous Semitic text ever deciphered was displayed publicly for the first time Monday at the Hebrew University of Jerusalem. Richard Steiner, professor of Semitic languages and literature at Yeshiva University, interpreted Semitic passages in Egyptian texts discovered more than a century ago inscribed on the subterranean walls of the pyramid of King Unas at Saqqara in Egypt sometime between the 25th and 30th centuries BCE. Earlier than PaleoJudaica's usual time frame, but too cool not to mention. The Canaanite priests of the ancient city of Byblos, in present-day Lebanon, provided these texts to the kings of Egypt. It's not strictly speaking "Canaanite," since the "Canaanite shift" (original long a changes to long o) didn't happen until the late second millennium BCE. Still, the early third-millennium natives of Byblos would have spoken a dialect that was perhaps very early (proto-? )Northwest Semitic and ancestral to Phoenician and a sort of great-great aunt to Hebrew. Although the Egyptians viewed their culture as far superior to that of their neighbors, the find shows that their morbid fear of snakes made them open to borrowing Semitic magic. "This finding should be of great interest to cultural historians, linguists and Biblical scholars" Steiner said. "This is a sensational discovery," said Hebrew University Professor Moshe Bar-Asher who is the president of the Academy of the Hebrew Language. "It is the earliest attestation of a Semitic language, in general, and Proto-Canaanite, in particular." The texts also shed light on several rare words in the Bible, Steiner said. Also, Manuscript Boy e-mails with the information that a lecture by Steiner in Hebrew also deals with this text. You can download it from the Hebrew University website as a PDF file here. Today's Ancient Judaism Seminar in St. Andrews went very well. I'll try to post something on it tomorrow. I hope Blogger doesn't eat this update again. I thought we were past that! 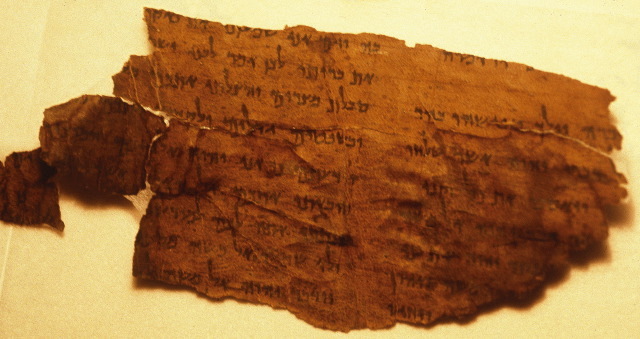 The Semitic language of these texts that have now been deciphered was a very archaic form of the languages later known as Phoenician and Hebrew, Steiner said. The text includes words that have the same meaning as in Hebrew, like "yad" for hand, "ari" for lion, and "beit" for house, he said. Following your links, I read Steiner's paper; it seems he thinks the dialect he's found does show the Canaanite shift. The "traditional" dating is based on its non-existence in Ugaritic, but if Ugaritic is outside the Canaanite family anyway, this may simply push the date of the shift back by a thousand years, and clarify to some extent the position of Ugaritic in NWS. I seem to recall some limited evidence for the Canaanite shift in the Mari Letters in the early second millennium BCE, but to have it nealy a millennium earlier than that would be very interesting. UPDATE: Nice wordplay at Metafiller: Snakes off a Pharaoh. Good supplementary links too. I thought about this inscription and its location on a wall and was tempted to say "Snakes on a Plane," but I restrained myself. Until now. UPDATE (26 January): An Egyptologist is skeptical. UPDATE (27 January): Duane Smith comments on the Canaanite shift over at Abnormal Interests. The Southern Branch of the Islamic Movement, headed by Ra'am-Ta'al chairman MK Ibrahim Sarsour, on Sunday accused Israel of carrying out excavations underneath Jerusalem's Temple Mount, known to Muslims as the Noble Sanctuary. Sarsour also claimed the Israel Antiquities Authority paid a Palestinian vendor $60,000 for his store along the Temple Mount. The Israel Antiquities Authority denied the accusation. Earlier on Sunday, the Northern Branch of the Islamic Movement presented pictures taken two weeks ago that allegedly documented excavations near the Temple Mount. An inquiry by Haaretz revealed that the excavations referred to by Sarsour were carried out some 100 meters from the Temple Mount and were stopped due to lack of funds. The excavations, carried out by the Israel Antiquities Authority at the behest of a Jewish group on property owned by businessman Aaron Mosovitch, was first revealed by Haaretz about a year ago. In the article, archaeologists said the excavations were not only vertical, but horizontal, and advanced to within 60 meters of the Temple Mount. However, archaeologists claimed the purpose of the dig was to clear out an old garbage-filled tunnel to determine whether it posed a safety hazard. There's more coverage of the claims by Al-Jazeerah, Arutz Sheva, and Ynet News. Similar claims were made in January of 2006 and I covered them here. The Hadash-Ta'al Knesset faction has requested an urgent debate in the Knesset Interior Committee following the report published in today's Hebrew edition of Haaretz magazine on excavations the Israel Antiquities Authority (IAA) is carrying out in Jerusalem's Old City. The IAA, which is carrying out the excavation for the Ateret Kohanim association, has dug 12 meters into the foundations of a Jewish-owned building in the Muslim Quarter, 80 meters from the Temple Mount, and has progressed about 20 meters to the east under other buildings, toward the Temple Mount. [Director of the Jerusalem district of the IAA, Jon] Seligman said excavation to the east "has ended for the time being." He also said he had not heard about a possibility that the dig would link up to the Western Wall Tunnel. However, sources involved in the excavation said they had heard from its directors that this was the case. Attorney Eitan Geva, who represents the owner of the building, said the intention is to build a museum at the site where finds discovered during the excavation would be displayed. Eitan said the excavation to the east involved clearing out a channel that had been discovered, to ascertain whether it endangered the building's foundation, and that after the earth was removed, it was sealed. There was no intention to use it or continue digging eastward, Eitan added. But it appears that people were not informed of digging going under their houses, although there is a legal requirement that they be notified. WHAT IS A JEWISH MYTH? asks Rabbi Geoffrey W. Dennis in the New-Age-but-thoughtful Llewellyn Journal. The essay is more about what myth is in general, but it does touch on Judaism as well. Mitchell, C.W. (ed. ), S. Ephraim's Prose Refutations of Mani, Marcion, and Bardaisan. Vol. 1: The Discourses Addressed to Hypatius (London: Williams and Norgate, 1912). Hill, J.H., A Dissertation on the Gospel Commentary of S. Ephraem the Syrian with a Scriptural Index to his Works (Edinburgh: T&T Clark, 1896). Cureton, W. (ed. ), History of the Martyrs in Palestine, by Eusebius, Bishop in Caesarea, Discovered in a Very Ancient Syriac Manuscript (London / Edinburgh: Williams and Norgate / Paris: C. Borrani, 1861). Payne Smith, J. (ed. ), Extracts from the Ecclesiastical History of John, Bishop of Ephesus (Semitic Study Series 13; Leiden: E.J. Brill, 1909). Payne Smith, R. (tr. ), The Third Part of the Ecclesiastical History of John Bishop of Ephesus (Oxford: Oxford University Press, 1860). Payne Smith, R. (tr. ), A Commentary upon the Gospel according to S. Luke by S. Cyril. 2 vols. (Oxford: Oxford University Press, 1859). Budge, E.A.W. (tr. ), The Paradise or Garden of the Holy Fathers, Being Histories of the Anchorites, Recluses, Monks, Coenobites, and Ascetic Fathers of the Deserts of Egypt between A.D. CCL and A.D. CCCC circiter. 2 vols. (London: Chatto & Windus, 1907). Connolly, R.H. and Codrington, H.W. (eds. ), Two Commentaries on the Jacobite Liturgy by George Bishop of the Arab Tribes and Moses Bar Kepha: together with the Syriac Anaphora of St. James and a Document Entitled The Book of Life (London / Oxford: Williams and Norgate, 1913). Lewis, A.S. (tr. ), Select Narratives of Holy Women from the Syro-Antiochene or Sinai Palimpsest as Written above the Old Syriac Gospels by John the Stylite, of Beth-Mari-Qanun in A.D. 778 (Studia Sinaitica 10; London: C.J. Clay and Sons, 1900). Wensinck, A.J. (ed. ), Legends of Eastern Saints Chiefly from Syriac Sources. 2 vols. (Leiden: E.J. Brill, 1911, 1913). Gibson, M.D. (ed. ), The Commentaries of Isho`dad of Merv, Bishop of Hadatha (c. 850 A.D.), in Syriac and English. 3 vols. (Horae Semiticae 5-7; Cambridge: Cambridge University Press, 1911). Gibson, M.D. (ed. ), Apocrypha Arabica: Kitab al-Magall, or The Book of the Rolls; The Story of Aphikia; Cyprian and Justa, in Arabic; Cyprian and Justa, in Greek (Studia Sinaitica 8; London: C.J. Clay and Sons, 1901). Saeki, P.Y., The Nestorian Monument in China (London: Society for Promoting Christian Knowledge, 1916). Phillips, G., Syriac Grammar (3rd revised ed. ; Cambridge: Deighton, Bell & Co / London: Bell & Daldy, 1866). Malan, S.C. (tr. ), The Book of Adam and Eve, also called the Conflict of Adam and Eve with Satan (London: Williams and Norgate, 1882). Good stuff. The Story of Aphikia is an Old Testament pseudepigraphon about the legendary wife of Ben Sira. We considered including it in the More Old Testament Pseudepigrapha Project, but we finally decided that it was too late. I see that The Life of Adam and Eve is included at the end of the list as well. We're including new Coptic material for it in the MOTP. I've also mentioned the Nestorian Monument in China recently on PaleoJudaica. That's a very useful list of texts from "lagus1974". There are titles in other languages too, for any who may find them useful. For example on this site I also found:S. Ephraem Syri Opera, with text in Syriac, Greek and Latin, commentary in Italian. (Ed. )Silvius Ioseph Mercati, Sumptibus Pontificii Instituti Biblici, Rome 1915. What stirred your interest in obscure religious sects in the first place? My father was a biologist who had no use for religion. He thought it was naive. But at 13 and 14, I began to find religious notions powerful and compelling. Whether it was the great cathedrals of Europe or Hopi dancers, I sensed in them a potent spiritual dimension of life that I just had to explore. Later, when I went off to study the early history of Christianity at Harvard, I was surprised to discover that my professors had file cabinets filled with early Christian texts that didn't make it into the Bible. We were told they were bizarre, heretical, nonsensical, full of philosophical fantasies and religious junk. That's also what the fathers of the orthodox Christian church said. They called them "illegitimate secret writings." After a close read, they changed my understanding of what early Christianity was all about. The word "Gnostic" derives from "gnosis," the Greek word for knowledge. But what is Gnosticism? We really don't know. The term "Gnostic" has been used in so many ways over the years it's hard to say. The label has been used by people who attacked certain early beliefs as the wrong kind of Christianity and by New Agey types. Referring to the authors of these texts as Gnostic only accepts that negative judgment. But the people who wrote them didn't think of themselves as belonging to a school called Gnosticism. They were spiritual leaders who thought they had gone beyond simple faith to a deeper understanding. Essentially, they were trying to make a distinction between anthropomorphic notions of God and the divine reality. I agree that "Gnosticism" isn't a very useful category in scholarly terms. Most of the time it can be replaced with something like "adherence to the demiurgic myth" (the myth that the creator of our world is an imperfect derivative god, not the True God). Where do they rank in comparison with the Gospels of Matthew, Mark, Luke and John? I think of them now as the other texts that were not included in the canon. Much of what was in the canon was to be used in public church. But, as in Judaism, there were certain secret teachings — or advanced teachings — that were not to be taught publicly or even written down. They were only to be shared with certain disciples when they were ready. In other words, the New Testament Gospels were the texts students of Christianity began with. Some moved on to the secret teachings. She really should have added that the four canonical gospels can be dated to the second half of the first century or the very beginning of the second century at the latest. All our evidence indicates that the Gnostic gospels come from later in the second century or later still. With the possible exception of the Gospel of Thomas (which I would not count as "Gnostic"), the noncanonical gospels give us no new information about the historical Jesus or the first generation of the Jesus movement. But anyhow, read it all.